If you are driving to Exeter, you'll need to know where you can leave the car. Parking in Exeter's city centre is available in several short and long stay car parks. A 'Park & Ride' scheme is operated from Monday to Saturday. The scheme works by drivers parking their vehicles on the city outskirts in one of four designated car parking areas. Four areas are provided for visitors, shoppers and workers to park up their cars and travel right into the heart of Exeter. Three car parks are for travelling into the city centre and one for the Royal Devon & Exeter Hospital. 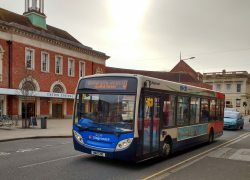 After parking up at the Sowton, Honiton Road, Matford or Digby (RD&E) Park & Ride areas you can then catch one of the regular buses into the city. The parking is usually free, just the return bus fare is purchased. Please check operating times and off-peak availability via the transport further information below. For travel to Exeter city centre - Located just off the M5 at Junction 30. 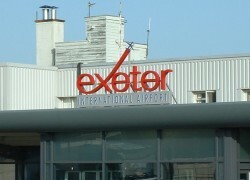 For travel to Exeter city centre - Located off the A379 / Sign posted from the A38 and A30 North bound. For travel to Exeter city centre - Located just off the M5 at Junction 29. For travel to the Royal Devon & Exeter Hospital - Located off junction 30 of the M5 / A379, near Tesco. Street parking in and near Exeter city centre is limited and what is available is restricted to mainly resident and short-stay. If you need to park for the day an alternative option would be to use one of the designated city centre car parks that supply several thousand parking spaces. This could be one of the council owned car parks or a shopping centre car park with each, the Guildhall, Princesshay and Harlequins having connecting parking facilities. NCP run a number of car parks in Exeter and offer season tickets and discount parking for advance bookings. Many of the car parks have varied closing times so these should be checked in advance.